Really excited about the improvements that FDT team is doing around Haxe and Ant. Recently I started working on a set of project templates for FDT 5.5 so that Haxe users can have a good work flow within FDT. The latest update of FDT adds the ability to make your Ant task a “Build Config”. 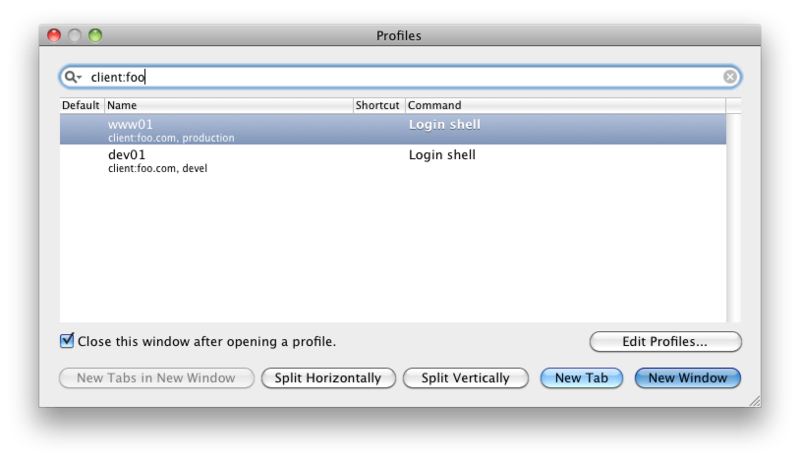 This way you can use your normal build / debug config keyboard shortcuts. This is a huge time saver if you are using the NME Ant builds. See the following video below. Just type the start of any word that has ever appeared in your window and then Cmd-; will pop open a window with suggestions. The word you’re looking for is usually on top of the list! Use the Find feature to begin searching for text. Press tab to expand the selection to the right or shift-tab to expand the selection to the left. Option-enter pastes the current match. Paste history lets you revisit recently copied or pasted text. You can even opt to have the history saved to disk so it will never be lost. Instant replay lets you travel back in time. It’s like TiVo for your terminal! Map any key to any function. Assign separate functions to each option key–or even remap all the modifier keys. You can customize iTerm2’s appearance to suit your needs: enable transparency, background blur, background images, and much more. 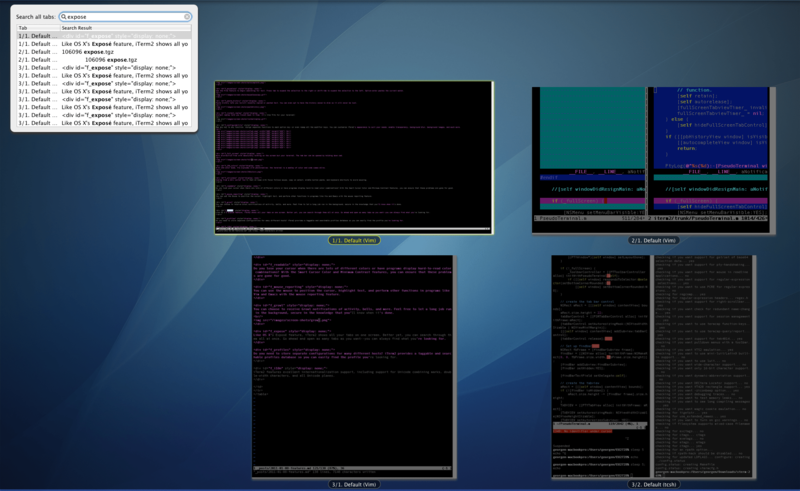 Work distraction-free with absolutely nothing on the screen but your terminal. The tab bar can be opened by holding down cmd. With 256-color mode, Vim explodes with photorealism: the terminal is a medley of color and code comes alive. Coming from a Unix world? You’ll feel at home with focus follows mouse, copy on select, middle button paste, and keyboard shortcuts to avoid mousing. Do you lose your cursor when there are lots of different colors or have programs display hard-to-read color combinations? With the Smart Cursor Color and Minimum Contrast features, you can ensure that these problems are gone for good. You can use the mouse to position the cursor, highlight text, and perform other functions in programs like Vim and Emacs with the mouse reporting feature. You can choose to receive Growl notifications of activity, bells, and more. Feel free to let a long job run in the background, secure in the knowledge that you’ll know when it’s done. Like OS X’s Exposé feature, iTerm2 shows all your tabs on one screen. Better yet, you can search through them all at once. Go ahead and open as many tabs as you want–you can always find what you’re looking for. Do you need to store separate configurations for many different hosts? 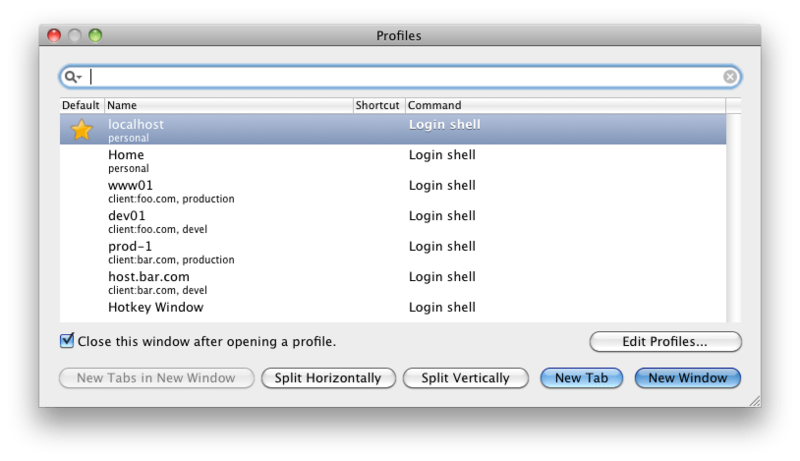 iTerm2 provides a taggable and searchable profiles database so you can easily find the profile you’re looking for. iTerm2 features excellent internationalization support, including support for Unicode combining marks, double-width characters, and all Unicode planes.